The application deadline has passed for this class. If you would like to be the first to know about the 2020 class, join the interest list! The Eno Transit Senior Executive Program is a 6-month long leadership development program designed for senior-level managers in the public transit industry. The program is centered around an intensive week-long seminar held in the Washington, DC area. Participants hear from distinguished guest lecturers, develop their leadership skills, and build connections in the transit industry. The Program is entering its 14th year and has more than 500 alumni. 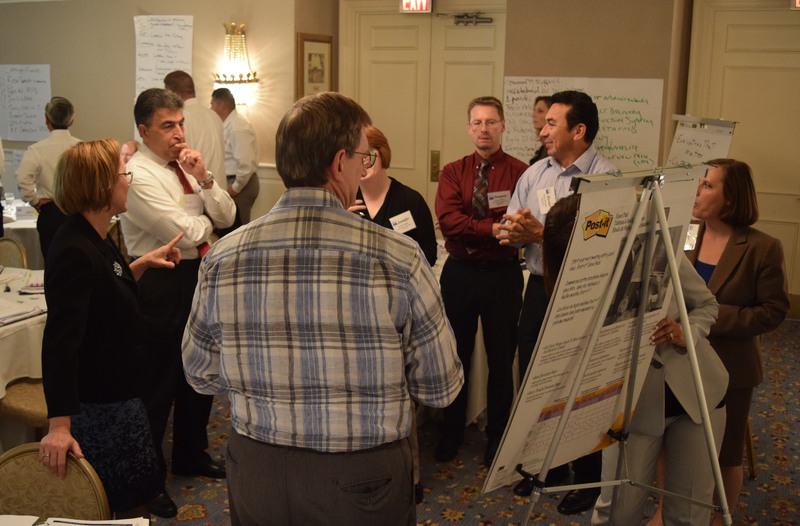 The TSE Program is designed for top public and private transit executives to participate in an intensive and confidential forum on strategic management, leadership, and critical emerging industry issues. In addition to the four instructors, participants learn from more than a dozen guest lecturers who are current or former transit general managers, senior Federal officials, or senior private sector staff. Admission to the Program is selective, and a nomination/application process is required. The program is tailored specifically for senior-level managers–generally in the top 2-3 layers of the organizational chart–who have a strong commitment to the public transportation industry and serve in a senior leadership capacity. GMs at smaller properties will also find the program helpful. The Program helps participants prepare for the next step in their career. The class is appropriate for executives from public agencies, contract operators, private sector firms. Participation in other leadership programs will be given extra consideration during admission, including the Eno Transit Mid-Manager Seminar and programs offered by APTA and National Transit Institute. Applications for the 2020 program will open in the fall of 2019. If you would like to be the first to know about the 2020 class, join the interest list! The in-person course will take place on March 4th-8th, 2019 in the Washington, DC metro area. Program activities will begin in late January and will conclude in June 2019. An online course portal to connect with classmates, share information, and work collaboratively after class. A pre-course 360 leadership evaluation by supervisors, subordinates, and peers. Each participant receives a written report and a one-on-one confidential coaching session with an instructor. Permanent instruction team includes Teri Fisher, Eno Senior Advisor and Managing Partner of Insight Strategies, John Catoe, Eno Instructor and former COO of Los Angeles County MTA, and former General Manager of Santa Monica Big Blue Bus and Washington Metropolitan Area Transit Authority, Kevin Catlin, Eno Instructor and Managing Partner of Insight Strategies, Howard Permut, Eno Senior Advisor and retired President of MTA Metro North Railroad, and Alex Bond, Director, Eno Center for Transportation Leadership. Tuition for the Transit Senior Executive Program is $4,250. Tuition includes most meals during the in-person class. There is an option for 5 nights of hotel and tuition for $6,000. Tuition also grants lifetime Eno Alumni Association membership and Tuition includes a 6-month complimentary membership to the new web-based Eno Transportation Weekly, the premier transportation publication covering real-time legislative and regulatory industry news, upon completion of the program. Participants are responsible for travel to and from the class, lodging, and certain meals. It is estimated that travel and lodging will cost approximately $2200, but may vary depending on the student’s city of origin and travel schedule. Partial travel support may be available (see Scholarships below), and Eno will facilitate roommate matching to reduce lodging costs. A tuition invoice will be sent to the person named on the nomination form. Payment is due 30 days prior to the first day of the scheduled program. A room block has been reserved at the Alexandrian Hotel for a special rate of $199.00, plus 14.5% tax, per night for a standard guestroom. Information on how to make reservations will be sent directly to the students after they have been selected. There are three scholarship opportunities available to Transit Executive Seminar applicants: a) The Frank J. Lichtanski Memorial Scholarship offered by the American Public Transportation Foundation; b) the Robert J. Prince, Jr. Scholarship offered by the Conference of Minority Transportation Officials (COMTO); and c) Eno Alumni Fund Travel Grants. Participants apply to scholarships simultaneously with their application to the Program. If a participant is admitted but is not awarded a scholarship, he or she can choose to attend at full tuition or defer admission to a later year. For questions about the Transit Senior Executive Program, please contact Erin Shumate, Senior Manager Training and Events, at eshumate@enotrans.org or (202) 879-4703.